It's been a long time since I've found time to write a tutorial. But now I'm back in business, so bare with me, read the tutorial and you'll be rewarded with a nice project and a temperature controller. Since I'm fan of the IoT I'm always looking for new hardware. So after testing a lot of boards (Raspberry Pi, Banana Pi, Beagle Bone, Arduino etc.) a friend of mine sent me link with an unknown board (at least for me): Linkit Smart Duo. I read the manufacturer description and I was convinced to give it a try and I wasn't disappointed. As I said I was amazed how easy is to work with this little device. Since I don't like messing with wires I designed a PCB for making a permanent project. The interface consists of 3 Tabs: Dashboard, Termperature Control, and Log. Here the controls are self explanatory. This is the temperature control tab. The Setpoint Low slider selects the minimum temperature. The Hysteresis slider selects the difference between the min and max temperature. Setpoint High is the sum of Setpoint Low value and Hysteresis value. Now, you have two dropdown controls one is Mode and another is Control. With Mode you can select if the controller it's used for heating or cooling. When in Cooling mode the device will wait until the Setpoint High temperature will be reached. In that moment it will send a command to the relay that is controlling the cooler and the cooler will be turned on. It will stay on until the Setpoint Low temperature will be reached. And the cycle will go on. In Heating mode the device will wait until Setpoint Low temperature will be reached. From that moment the heater will be turned on and it will stay on until Setpoint High temperature will be reached. For this to happen the selected Mode must be "Automated". When this mode is active the device will ignore all the commands sent manually (by pushing "T. Controller" button). To control the device manually you will have to switch on Manual control. Last but not least I used a Graph which will record the temperature and the working cycles of the controller. 1x I2C header for various devices that are using this protocol. 1x 1Wire screw terminal for connecting the famous 1wire sensor DS18B20. The PCB is placed in a small case that can be mounted on DIN rail. Because of the space available I decided to use an external board with 4 relays. Note: Because the relays are turned on when digital output is 0 the logic is reversed. Please take this into account if you want to modify the code. I will not insist on describing the Linkit Duo because you can find all the information on official page . Install Arduino with Linkit Smart support. Fortunately you will have to do all these steps only once. Now that you know Linkit Duo local IP address it's time to access it using secure shell, in short SSH. For this i used Putty. So download Putty from here, enter your IP address and type in the user (root) and password that you set on first step. As you can see Linkit Duo it's running a linux distro called OpenWrt. So you can enjoy all the benefits that an OS has, though OpenWrt it's not the most friendly distro. Now take a deeep breath and proceed to the next step. Since the device has only 32 MB available for storage, with limited read/write cycle you'll wand to mount the file system on a SD card. This is very important. For this you'll have to read the tutorial listed here. Now that we installed everything and we have access to the device file system it's time to write the software for making things happen. The MPU will deal with the Blynk server by sending the status of the sensors and reading the commands. That being said we have to write two programs: one for ATmega32U4 (Arduino) and one that will deal with Blynk server (Node JS). As you can see there is no code in loop(). That's because Tasker will take care of everything. Note: Please read the code comments. 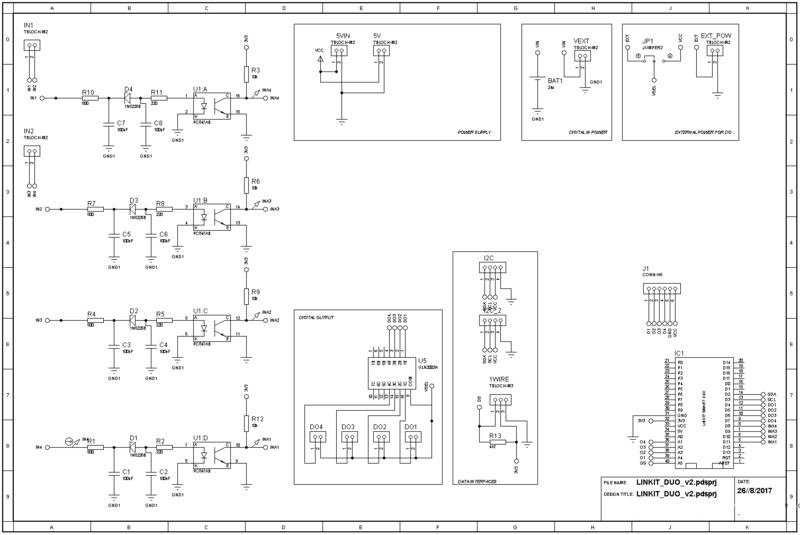 So download the sketch and upload to the microcontroller. Now login with WinSCP to your device and inside root direcory create a folder called "apps" inside this folder create another called "node" and finally inside of the last created folder (or directory :) ) create a folder named "blynk". Inside this folder create an empty file and name it app.js. Copy/paste the Node Js code inside and you're done. Installing serialport it will take forever, so be patient :) ! The easiest part is to use Blynk. For this, download the app either for IoS either for Android create an account and scan the QR code below. Blynk is free. But you will only get 2000 credits when the project is started. This project is made with 6400 credits so you will need to buy 5000 credits more. Don't worry it's cheap only 3.99$. Take care, R1, R4, R7, R10 must be rated at 1W. Here the temperature is read. Here the conversion of temperature is started. If there is nothing on Serial it will send the current status. //if there is a new command it will be executed. If not the current status will be sent. /*Every 250ms Arduino will send the current status. blynk.virtualWrite(0,this.crtTemp);//send to Blynk the current temp. //This button is locked if control is automated.